If you haven't heard of a yuzu (Citrus junos, synonym Citrus ichangensis x Citrus reticulata var. austera) tree, you're not alone. But the yuzu tree is slowly gaining popularity. The tree is believed to be a natural hybrid of an Ichang papeda and a sour mandarin. Originating in China, it was introduced into the U.S. in 1914 by USDA explorer Frank Meyer. A small tree, it usually grows about six feet tall, but can grow up to eighteen feet tall. A cold hardy citrus tree, it can withstand temperatures down to 21 degrees Fahrenheit. Its branches have long thorns. The tree is hardy down to USDA zone 8. 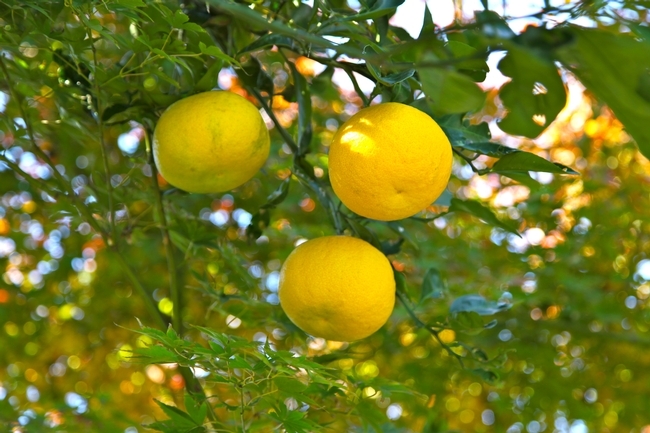 The highly aromatic yuzu fruit usually measures slightly less than 2” wide and about 1.7” long. It has a distinctive dimpled rind with prominent oil glands. The outer rind turns from green-yellow to yellowish orange when the fruit is mature. The fruit has a strong spicy lime/grapefruit fragrance. The yuzu has very little pulp and many inedible seeds (about two dozen per fruit). The pulp is sour and acidic and described as tasting like a cross between a grapefruit and a mild lemon or lime or orange. Thus the fruit pulp is rarely eaten. The fruit is usually grown for its zest and juice, both of which are used in making Japanese Ponzu sauce, a popular soy-based sauce. Yuzu juice and rind is frequently used in Japanese cooking. And in Korea, a yuzu marmalade is very popular. Slivers of the rind are used to flavor a variety of cooked dishes ranging from fish to meat. Yuzus are also frequently infused into liqueurs. Yuzu juice is commercially bottled and can be found in specialty stores. The juice is touted as a super juice because it's said to have three times as much vitamin C as lemon juice. Plus, a few studies have shown that the Yuzu aroma has therapeutic effects like lavender. And a limited number of studies conducted on rats show the Yuzu holds future hope for potentially preventing cognitive dysfunction. In Japan, there's a tradition during Toji, the Winter solstice, dating back to the eighteenth century that some people still engage in today. During Toji, taking a yuzuyu, or yuzuburo, i.e. a yuzu bath where the whole of half yuzus would be floated in warm bath water is believed to bring good fortune and good health, relax the mind, and protect against seasonal maladies like colds and dry skin. Now you can see why yuzu trees are slowly growing in popularity. If you like growing a variety of citrus trees, you may want to add a yuzu tree to your collection. Can it take the Vacaville ? How do tolerate frost/cooler temps? Which local nurseries carry the tree ? A better time to plant a yuzu tree is in the Spring when all danger of frost has passed. For information on protecting citrus trees from frost, see the UC ANR publication “Frost Protection for Citrus and other Subtropicals” at http://homeorchard.ucdavis.edu/8100.pdf. My experience is that most local nurseries will order a specific tree for you if they don’t have it in stock. I also just did a Google search and came up with the following California nurseries listed as selling yuzu trees. Or if you want to graft your own tree, you can order yuzu budstock from the California Citrus Clonal Protection Program at https://ccpp.ucr.edu/.